Now we are also starting to see high budget games climb on the top grossing charts. If you still believe that the AppStore can still have indie success on the Top Grossing, the stakes are rising. Games from now on will need significant investments in their visuals on top of having a strong economy design to succeed. But is this game just all glam, but no substance? Can Marvel sustain in the Top Grossing? 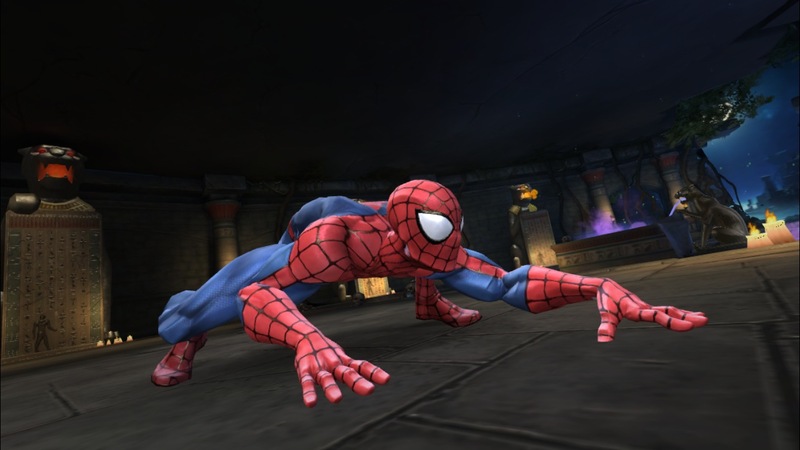 Its a simple premise, but Kabam’s secret formula of events, multiplayer gameplay and monetization is a powerful force. They’ve proven this before with the Hobbit’s mobile game and the Fast and the Furioius mobile game. Injustice: Gods Among Us was a game released in March 2013 by DC Comics and Warner Brothers. Its essentially a very simple fighting game at its core with a collectible card game as its meta. Both Injustice and Contest of Champions are similar to Idle games where it really gives players a “bait and switch”. Based on the screen shots you’d think this was the next Street Fighter or Mortal Kombat. But after the first battle you quickly get introduced to the true intention of the game : collecting the characters and upgrading them. You came for the 3D fighting mechanic, but are quickly hooked in the long haul to collecting the characters. Comparing Injustice to Marvel Contest, Marvel has simpler controls, easier strategy, and much shorter battles. 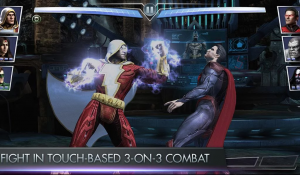 Injustice focuses on building up a combo enough to do a quick-time-event (“Swipe to knock down opponent”) whereas Marvel is more about building up a sustained combo of attacks of choosing whether to jab (which can be defended) or go for a heavy attack which can break defenses. Fights are much shorter because they’ve cut out the 3v3 battle. Its 1 on 1 like original fighting games with victory based on the first KO. Overall I believe the changes make the game better for mobile. Its easier to play and the fights are quicker. This allows players to complete sessions in less time and spend more time in the metagame. However, moving from 3v3 sacrifices some of the strategy in the battle. As a result battles quickly grow pretty tedious, which puts more pressure on the metagame to keep the strategy. So how did Marvel fill the gap in the Meta? Unlike Gods Among Us, Kabam also chose to focus on elemental types. This adds more strategy to choosing which hero you bring to different fights. Also to make sure that the simple 1v1 fights don’t push players to collect and invest in only 1 hero, they added elemental types which push players to collect heroes of each element. Each element has a strength and a weakness. 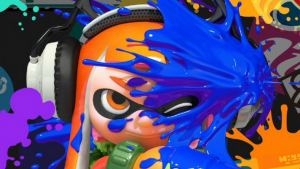 So each time the player enters a match, they run the risk of facing up against an enemy which is their weakness. This adds strategy to choosing who you bring along and making sure you have a spread of different strong heroes for each type. Note here that the Scarlet Witch shouldn’t be paired up against Hulk. The player should try to find a better matchup. This is really where Contest of Champions gets interesting. At the metagame layer, the game delivers on the licensee’s strengths. There are a ton of different Marvel heroes to collect, each of which has their own, stylized 3D model. Each character feels unique. Each character looks beautiful. As a fan of Marvel, you’re really driven to collect your favorite heroes. However, this is where the monetization and retention come in. To get your favorite hero, you need to get lucky in the Gacha system. These Crystals are the most important design decision that Kabam made. Each time they complete the actions needed for the crystal, they are brought back to the storage area. Each time they are reminded of all the other options they can purchase, and all the other means to progress. Players know that in order to get heroes, they need to earn crystals. In order to earn crystals, they need to pay or play. Each crystal gives a chance of what you want. No crystal ever gives defined rewards. Want that cyclops? Well that’s the top prize in this crystal, so buying the crystal will not guarantee you earning Cyclops. This is gacha done perfectly. Gacha works because in the beginning players can purchase these gacha packs (crystals) and get great content. Each time they open a crystal they get a brand new hero they’ve never seen before. As time goes on, as a designer you introduce mechanics and promote content that drive players to want rarer and rarer star players. So a player wanting a 4 star rare Cyclops is going to have to purchase many, many gacha packs before they get exactly what they want. This should be taken with some fairness though. You want to make sure that player’s don’t feel cheated when they spend money. So similar to Hearthstone (each card pack includes 1 rare), Contest also guarantees a certain star tier with each crystal that is paid. Unlike Injustice: Gods Among Us and Mortal Kombat X (a recent release by Warner Brothers) Kabam chose to offer no direct purchasing of heroes. In Injustice, players can look at the store of all the heroes in the game and directly purchase the hero they want. In Marvel, players have to use Crystals to collect all the heroes they want. This design is more similar to Japanese games like Puzzles and Dragons, and has been a lucrative business for them. By cutting out the direct purchase and going for a more pure-Gacha system like Japanese games, they’ve maximized their revenues. Allowing players a direct purchase of the hero they want is a hit to your retention and monetization. You’ve given them the end game content for a single quick purchase. You can see this also when you compare Mortal Kombat X to Contest of Champions. Mortal Kombat X was recently released by Warner Brothers. Arguably each game is well designed and looks beautiful, but on a Total Revenue to Total Download ratio, Marvel comes out well on top. 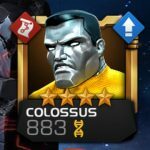 Kabam is simply far better at monetizing, and offering no direct purchase improves this metric. But the strength of Gacha lies only when you’ve added an additional layer: Rarities. In order for Gacha to work, you need to drive desire to get the absolute rarest items. In the beginning as a player it is alright to get a 1 or 2 star spider man. It feels good to get these heroes. But as you play, you quickly realise that this spider man isn’t going to cut it — you need to play your chances at getting the rarest heroes. 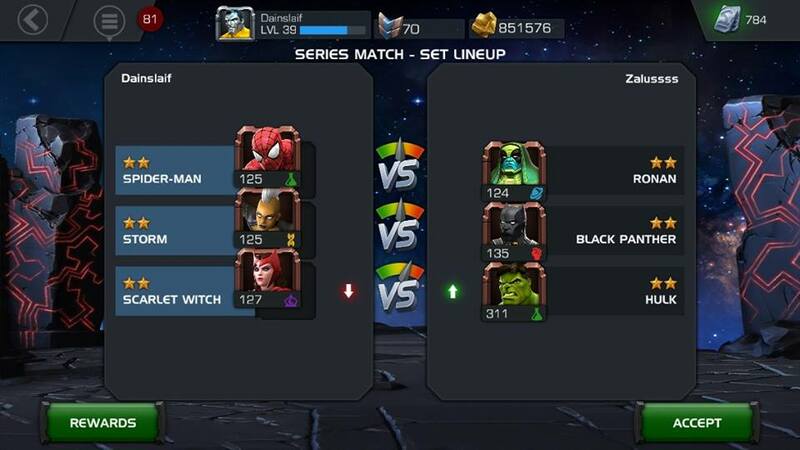 To do this, Kabam added Star Tiers to their heroes. Each hero can be found in 1 star to 5 star forms. The higher the star rating, the rarer the hero. Having a higher star hero increases their base stats, exponentially increases their potential highest level, and adds passive and active special abilities during the battle. All 3 of these are important to monetization and retention. Having strong base stats makes the hero feel powerful immediately versus opponents. Making sure that Rare monsters immediately feel good to purchase and easy to dominate opponents with is crucial to drive first time purchases. 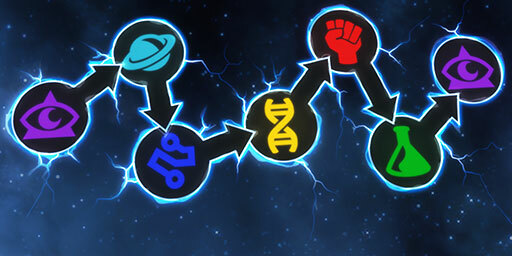 Exponentially increasing the maximum potential also increases the amount the player must invest their time and energy to reach the hero’s maximum potential. The higher the star rarity, the more time the player must spend to upgrade the hero to their maximum potential. For players to upgrade their heroes, they must use in different strands of ISOs. ISOs come from actively playing (mostly) so in order to fully upgrade your amazing 3 star champion, you have to collect ISO. This is essential for Long term retention. This mechanic nudges players commit to training their heroes to receive their full benefit. Without this exponential growth, players would pay for the best hero then forget about actively playing in the game. Lastly, Adding Passive and Active special abilities in the battle gives visual feedback to the player that what they are doing (collecting rare heroes) is worth it. 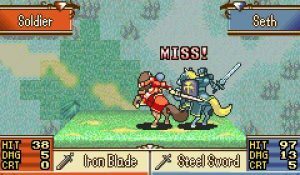 Heroes that are 3 stars or more have an extended special ability bar (as shown above in the bottom left). 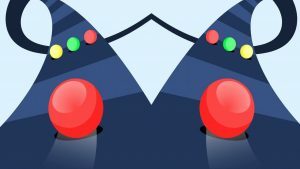 When the player fills up this meter, the hero shows a unique animation and does a lot of damage. You can only trigger this ability if you’ve got the 3 star or higher version of this hero. This is very important to ensure that players feel rewarded and powerful for getting the highest heroes. Just increasing a virtual number is not rewarding enough for players. Eventually you’re going to have to give players real visible rewards for getting the rare content. Kabam’s Contest of Champions decided to focus their innovation on outside the battle, in the Meta. The Meta for all games is what drives long term retention and strong monetization. This paid off for Kabam. As a result, Kabam have a top performing game. Marvel Contest of Champions innovations and design insights don’t just stop at the Gacha system. Rather than overwhelm you, I’ll put this one on pause for now. Next up I’ll focus on Multiplayer and Session Design.